Extensive know how in imaging components and vision system design for manufacturability. Out of the box mentality to create and offer groundbreaking technologies and solutions. User friendly products that require little or no effort to install and use. Nowadays, a wide range of design activities are done or supported by task-specific software. Mechanical engineers use CAD software, optical designers use optical modeling software and so do many other engineers with different specialties. 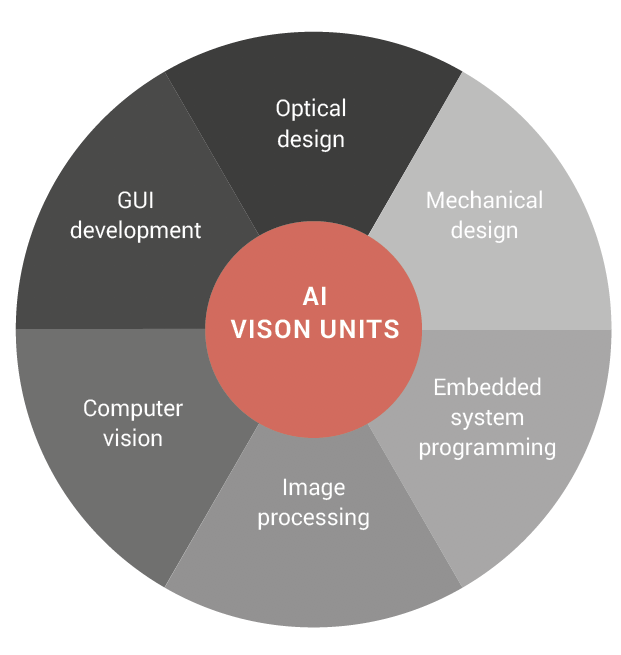 When talking about software in the machine vision industry, the first thought goes to image processing software. However, solving machine vision applications requires multiple software competencies as well as skilled professionals capable of developing products and solutions with the aid of dedicated software tools. From optical and mechanical design to FPGA or driver programming, going through image processing libraries and GUI development, rarely has a single organization had all these competencies internally. Optical Design: we are able to design and optimize many types of lenses for industrial use, with accurate manufacturing tolerance analysis and specific test protocols. Embedded system programming: our team can program different types of FPGAs and microcontrollers and develop specific firmware and drivers for custom electronic boards. Image Processing: we are competent in traditional image processing techniques and we utilize the most current computer science/mathematical technologies to highlight the features of interest in an image. Computer Vision: we can develop algorithms to train a machine to understand what it sees through one or more cameras, converting features extracted from an image into output information - I.e. the compliance of a product. GUI Development: we are able to develop standalone graphic interfaces, web-based programs and entire HMI packages for machine vision systems. A vision system is a computer based system that can see and provide analytical feedback on what it sees. In order to do this, the most various types of software are required. Opto Engineering® PENSO® and ALBERT® are self-learning machines that learn the characteristics of a product directly from the production line and autonomously determine its quality for sorting purposes. These advanced systems were developed thanks to our group’s multidisciplinary expertise in optomechanical design, embedded system programming, artificial intelligence, computer vision, image processing and GUI development. The design of a motorized optical system needs to consider the harsh industrial environment where the product may be deployed as well as customers’ expectations for long service life. Many zoom lenses on the market integrate motion mechanisms that fail prematurely or end up being inaccurate after a number of cycles. In order to make robust and repeatable zoom systems with easy to use functions, we gathered our experts in optical modeling, mechanical design, driver development. The result is our TCZRS, MZMT12X, ENMT motorized zoom lens series which guarantee very stable, flexible and precise performance.